Mairéad Ronan and Joe Lindsay in Turkey. This week, we follow along as Mairéad Ronan and Joe Lindsay cruise Turkey's Turquoise Coast, also known as the Turkish Riviera, the paradisal expanse of azure waters and white sands that has enthralled travelers for years. They scope out the best beaches, dive into the local cuisine and frolic in the crystal blue waters that made the area famous. 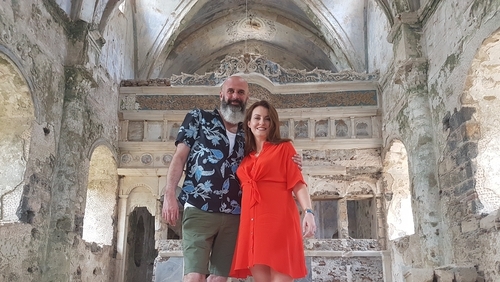 Mairéad and Joe have the tiresome job of exploring some of the most popular resorts along the shimmering coastline, including Oludeniz, a resort village whose name translates as "Dead Sea" due to the astounding tranquility of its waters even during storms. Here, the gem in the white sandy crown of the beach resort is a vivid blue lagoon, hugged close to the coastline, while visitors can paraglide, scuba dive and sample one of the many regional specialties on offer. White sands and turquoise water, what more could you want? Also on their tour is Marmaris, the former sleepy fishing village now a bustling tourist hot spot, nestled between towering mountains and stretches of blue ocean. As well as a thriving clubbing scene, Marmaris offers delights for the history buff in your troupe, including Marmaris Castle, a stunning complex that includes a museum, and which has been undergoing restoration since 1979. In Bodrum, an ancient and historically significant port city, we get a glimpse at one of the ancient world's most vibrant cities. Once the home of the Mausoleum of Mausolus, one of the Seven Wonders of the Ancient World, the city now features incredible remnants of ancient life, such as Bodrum Castle, built from 1402 onwards, and the Theatre of Halicarnassus. And Tommy Bowe discovers some of Armagh’s best-kept secrets on this week’s Short Getaway. And with "staycationers" embarking on no less than 26,000 trips around Ireland each year, we're certain there's enough in Armagh to keep the whole family entertained.